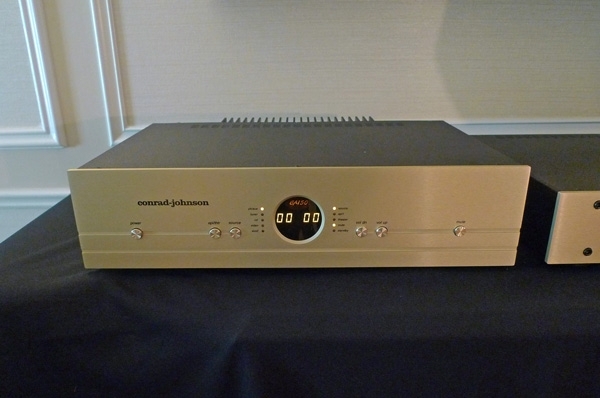 I talked with Bill Johnson for about 30-minutes, but it was enough to know I was completely enamored with the new Conrad Johnson CA150 integrated amp ($5000, or $7000 for the "ST" version with better parts) and the so-right sounding TEA 2 Triode Equalization Amplifier (aka RIAA phono stage) which costs $3300 stock, or $4500 with Teflon caps. Conrad Johnson's TEA 2 phono stage was being fed by one of my favorite moderately priced record spinners: the Acoustic Signature WOW XL ($2395) with its own TA-1000 tonearm ($1995) and an Ortofon 2M Black moving-magnet cartridge ($755). 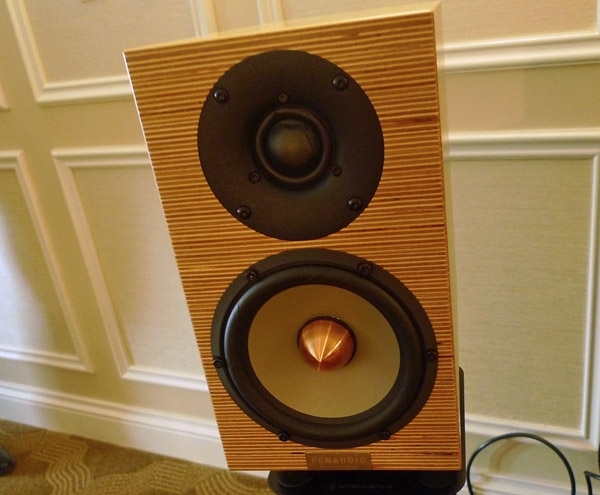 The CA150 integrated amp was driving the 2-way, stand-mounted Penaudio Cenya Signature loudspeakers ($4000/pair)the presentation had this fast forward-moving grainlessness that I found quite beguiling. Graham Nash seemed to know right away that these were the guys that provided the guts for his buddy Neil Young's Pono player and wanted to know all about it. After all, there is a version with Nash's signature on it. I'm grouping these two rooms together since we didn't listen to Graham Nash's album in either one, but rather had each host pick something out. We were getting behind schedule, so the idea was to expose Nash to some completely different speaker technologies back to back and see what he thought. I made my way from the main 2016 High-End audio exhibits at the Venetian Hotel over to the Harman exhibit at the Hard Rock Café. 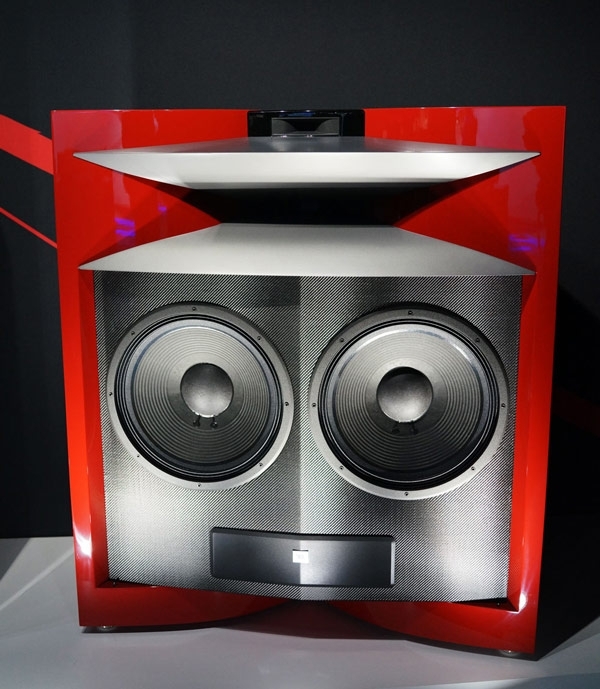 I was immediately captivated by a JBL Everest horn-loaded floorstanding speaker, its enclosure finished in an almost neon lipstick red, and its front baffle in brilliant silver. 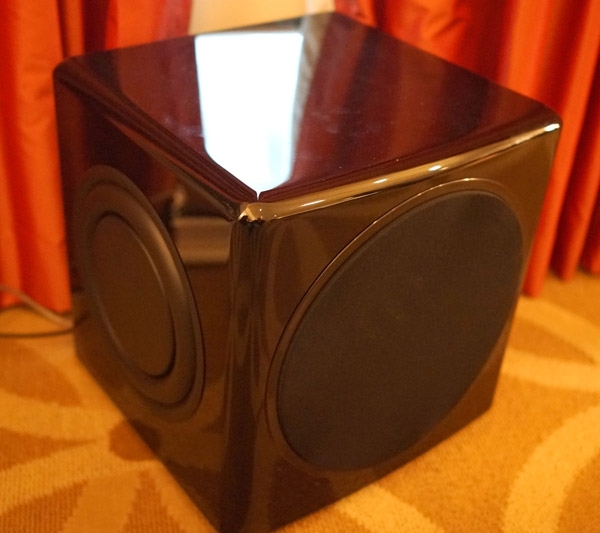 Thiel's new Intellisub was the highest-tech new subwoofer I encountered at CES 2016. It uses wireless control with convenient SmartSub app, which allows the user to control its digitally-processed, Auto-Room correction software. 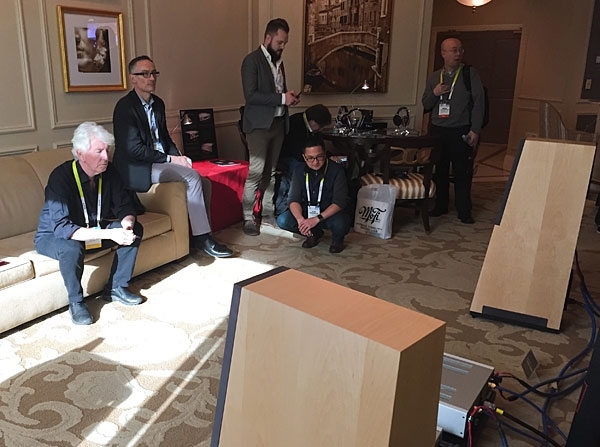 Rory Buszka, Thiel's engineer, explained that the built-in SmartSubXT system automatically adjusts its output based on measurements from 140 locations in the room. 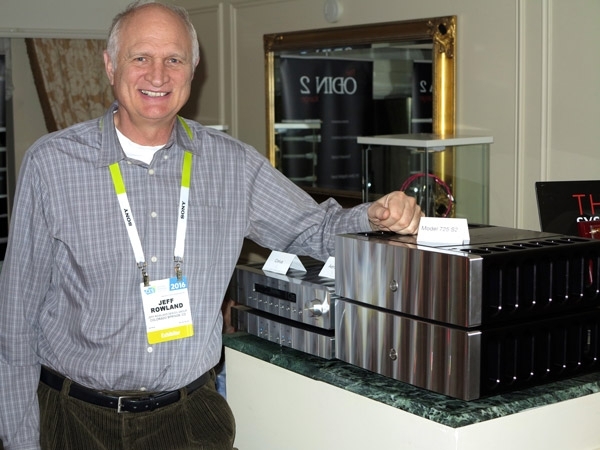 Is REL's "Six-Pack" Subwoofer Line Array Just What We Need? I ran into REL Acoustics' highly eloquent John Hunter on the way to the Venetian Towers, and he suggested I come by to hear the REL Acoustics "Six Pack." 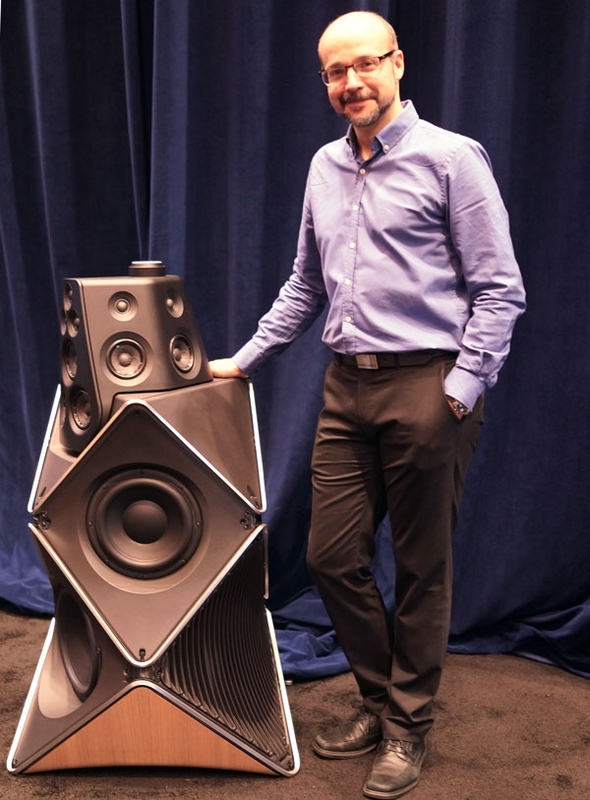 As it turned out, this was not a San Francisco microbrew special, or well-developed abdominal musculature, but twin towers of 3 stacked, (84 lb each) REL Gibraltar-2 subwoofers ($4000 each) set between two full-range Rockport Avior loudspeakers. Because the total 6-pack sets one back $24,000, I asked REL Acoustics' David Schultz if there might be a "Six-Pack light" version. Yes, he replied, we have the "poor man's six-pack," the REL Acoustics 212SE. Wireless-capable, the almost-70 lb, 212-SE sealed-cabinet enclosure stands 20" tall and uses two active 12" and two passive 12" drivers, all powered by the 1000W RMS class-D internal amplifier with a new low-noise 3-stage input circuit. 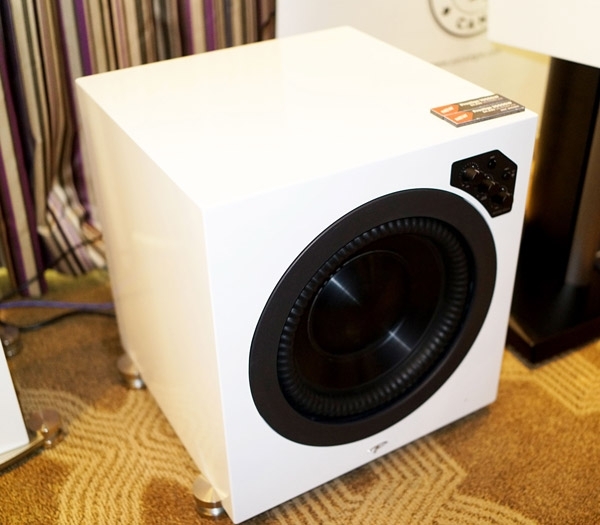 REL Acoustics was displaying their new S/5 SHO 12" subwoofer at CES. Like other S-Series subwoofers that came before, the S/5 has a forward-facing, 12" active driver and a 12" passive downward-firing passive driver. 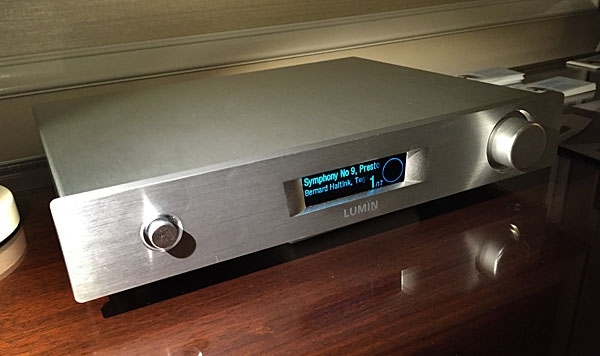 The S/5 can be driven wirelessly, and employs the 3-stage, low-noise "limitless" electronics for a wide-dynamic range and increased power output. 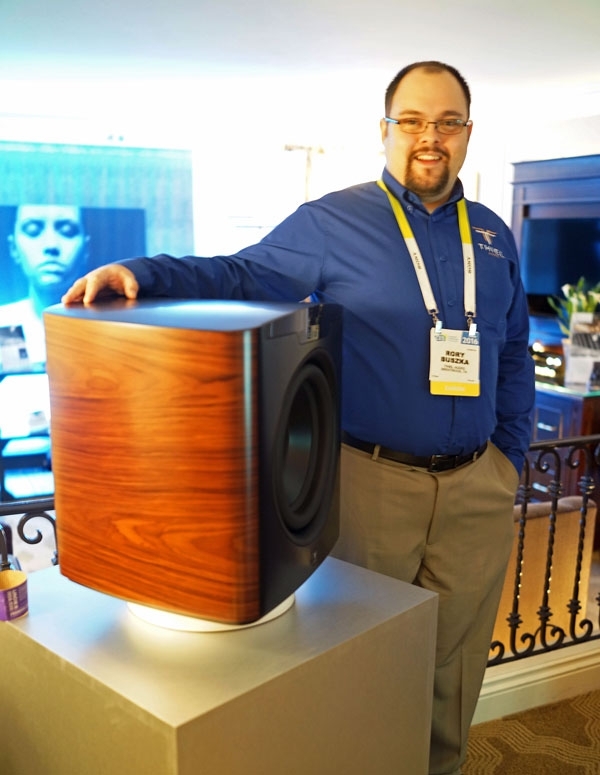 PSB Speakers was exhibiting a new bass-reflex subwoofer, the SubSeries (SS) 450, which will be shipping in April 2016 at a suggested US price of $1499. The driver features a 12", woven-fiber-glass cone. 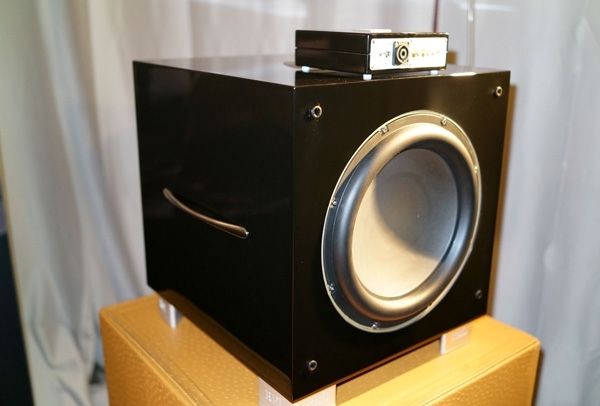 The subwoofer employs a 450W class-D amplifier, a built-in 4th order, continuously variable low-pass filter. The subwoofer was on exhibit and not playing. 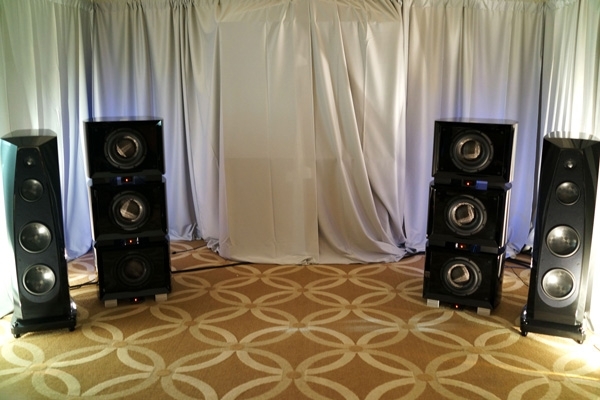 Paradigm exhibited its new Prestige 1000SW, 12" Subwoofer. Priced at $2999, the subwoofer uses a single 12" brushed-aluminum, high-excursion X-PAL driver in a sealed enclosure which is driven by a class-D, 1000W RMS (1700W peak) amplifier. 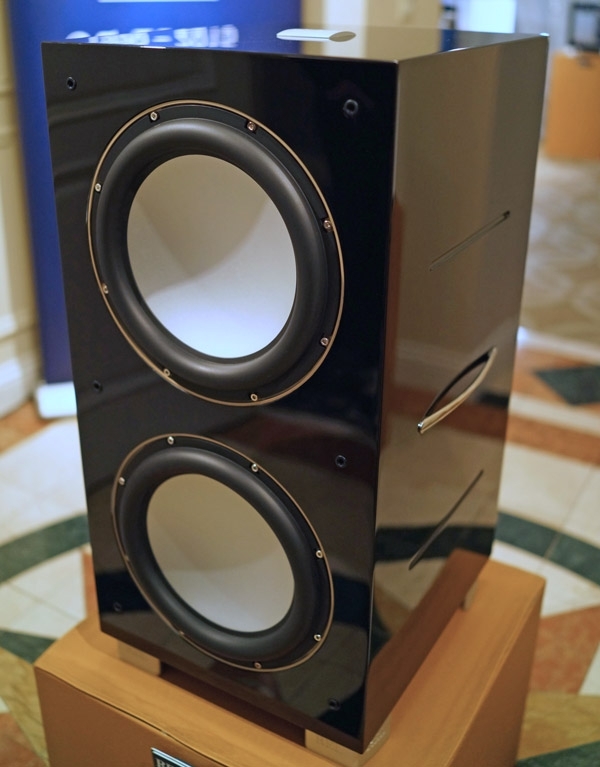 Jeff Rowland's Model 725 S2 monoblocks ($34,000/pair) have been out maybe four years, but now include new error-correction circuitry originally developed for the Jeff Rowland 625 S2. Also of import are ceramic circuit boards, 4-pole Jensen capacitors, and virtually immeasurable distortion from 20Hz20kHz. The class-A/B amps deliver 330Wpc into 8 ohms, and have fully balanced transformer coupled inputs as well as switch-mode power supplies with power-factor correction. 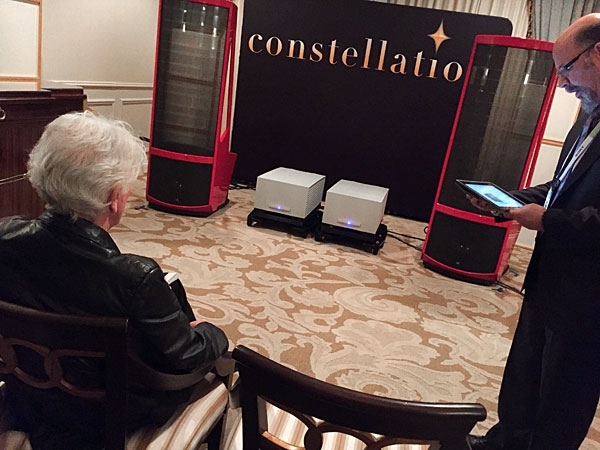 The display was passive, with Rowland's active system, complete with Nordost cabling, showcasing other products. 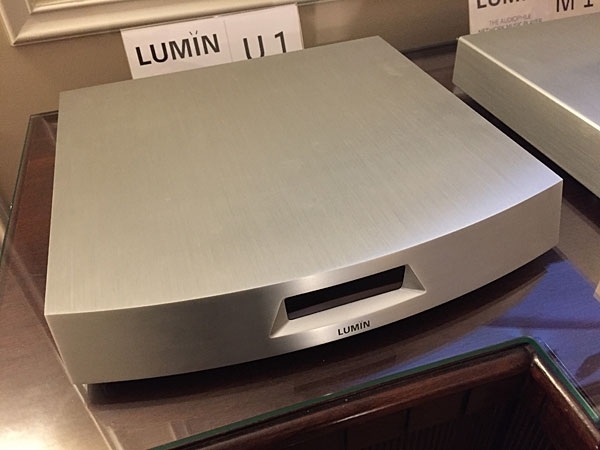 So new there isn't yet a firm US price (somewhere between $6-7k is the guess), the U1 is Lumin's latest high end network player with support for 32/384 PCM and DSD128. Tidal and Qobuz are built in and everything is run by the Lumin custom iOS and Android compatible music browsing app. On the back are five types of digital output: USB, SPDIF, AES/EBU, BNC, and optical. Digital inputs include Gigabit Ethernet and USB for external or flash drives. Should arrive in the US next month. Lots of all-in-one type digital music systems at CES this year, but this has to be one of the most simple and straightforward in purpose. You have a network ethernet port and a couple of USB inputs (for storage or flash drives) on the back and then left and right speaker posts. That's it, except for the power switch and plug of course.